What Are the Uses & Benefits of Garlic? Who Can Benefit from Garlic? Are There Any Side Effects of Garlic? How Do I Take Garlic Supplements? Are There Any Beneficial Garlic Stacks? How Do I Pick a Good Garlic Extract? Nature has provided us with herbs that can help support our health with naturally medicinal compounds, and many of these beneficial herbs may be sitting right in your kitchen. Garlic, one of the most popular cooking spices, can also be used as an herbal supplement to improve your health. It has anti-inflammatory and antimicrobial benefits that can help enhance immunity, fight against infection, reduce blood pressure, improve cholesterol, and more! The many benefits of garlic can help anyone to support and enhance their health. One way to consume garlic is through supplementation. In order to help you find a good product we’ve researched & narrowed down the best garlic supplements on the market right now. Solaray Organically Grown Garlic is one of the few garlic supplements that is formulated with pure garlic and a vegetable capsule, and no other ingredients. Solaray has formulated this product to have a quality garlic dosage with no fillers or binders at an affordable price. Solaray is the flagship brand of a nutraceutical supplement producer that was founded in 1973 in Utah, and later acquired in 1993. They offer thousands of different supplements available in over 60 countries worldwide, produced in GMP certified facilities. Their products are categorized by cap colors for ease of consumer navigation – green caps are single herbs, maroon is guaranteed potent extracts, blue is solar products blends, yellow is organically grown herbs, black is ayurvedic and red is cool cayenne herbs. Bottom Line: This is a pure garlic supplement that is suitable to vegetarians, effective and affordable! 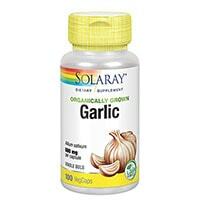 It is a fantastic garlic supplement, manufactured by the reliable brand Solaray. This product is free from fillers, binders and unnecessary added ingredients – and it can help almost anyone improve their overall health. 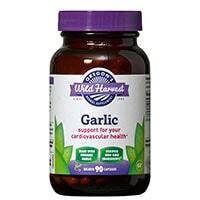 Oregon’s Wild Harvest Garlic is an affordable 100% vegetarian garlic pill that provides a powerful dose of garlic. It is formulated with organic garlic and 100% non-GMO ingredients. Oregon’s Wild Harvest is an herbal supplement brand that was founded in 1994 by a registered nurse and his wife, and today produces more than 200 herbal supplements. Their products are made from whole herbs that are scientifically tested for purity and potency. Bottom Line: The many benefits of Oregon’s Wild Harvest Garlic can support the health of vegetarians as well due to the vegetarian capsules. 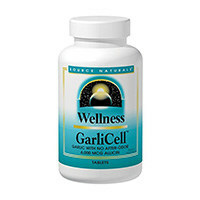 Source Naturals Wellness Garlicell is a good garlic choice that is formulated to be free from after odor. It contains 5.2mg of gamma-glutamylcysteine. It also contains 6mg of the medicinally active compound allicin. Source Naturals is a nutraceutical brand with over 600 health products designed to treat a wide variety of health needs. It was founded in 1982 with the idea to provide supplements that help maintain well-being and enhance life. They were the first brand to accomplish this by blending herbs, nutraceuticals and nutrients in one formulation. Solgar Garlic Powder is a powerful garlic option that yields high gamma-glutamylcysteine content, making it an effective supplement. It is free from any other ingredients besides the vegetable capsules it is delivered in. Solgar is a well-known supplement brand that has decades of experience in the supplement industry. Since its founding in 1947, Solgar has been producing high quality science-based supplements. All of their products are scrutinized under their gold standard of manufacturing quality control. 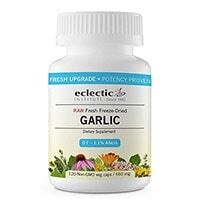 Eclectic Institute Garlic is a gel capsule fresh freeze-dried garlic pill that is suitable to vegetarians. The formulation contains the active co-factors in the same amounts as the natural herb, making it as close to fresh garlic as possible without having to endure the burn of raw garlic. 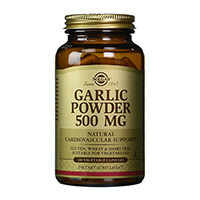 This whole-herb garlic pill is good for those who want to get as close as possible to the natural garlic plant. Eclectic Institute is a natural supplement producer that was founded in 1982. Today they sell a wide variety of herbal products organized by the functions they support. Their supplements are produced from their organic farm in the base of Mt Hood. Bottom Line: If you are interested in a solid garlic pill that is as close to fresh garlic as possible, this may be the right supplement for you. Eclectic Institute Garlic contains freeze dried garlic in a vegetarian gel capsule. 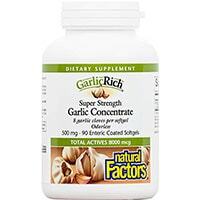 Natural Factors GarlicRich is an odor controlled garlic pill formula that is enteric coated, which helps ensure that the medicinal compounds in garlic make it to the small intestine for absorption. This product provides super high allicin and, aliin (precursor to allicin) and gamma-glutamylcysteine content. Natural Factors is a natural supplement brand that manufactures products from farm-to-table. Their certified organic farm is located in an alluvial valley in BC, Canada. They also are dedicated to sustainable farming practices, and their products never contain GMOs. Bottom Line: It is enteric coated to promote absorption, and odor controlled to reduce potential side effects like garlic breath. 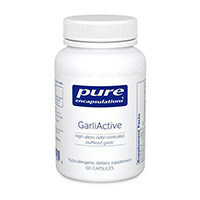 Pure Encapsulations GarliActive is a high allicin odor controlled garlic pill that is standardized to contain at least 9mg allicin. It is hypoallergenic and contained in a vegetarian capsule. Pure Encapsulations products are all tested by third party laboratories, so you can be positive that it contains only the ingredients listed on the label. Pure Encapsulations is a well-known supplement producer that creates hypoallergenic, science-based formulas for a variety of health purposes. All of their products are manufactured in a GMP certified facility that exceeds the United States Pharmacopeia’s standards. Bottom Line: This product is odor controlled, and it has a high allicin content, which is the active antiviral, antibiotic and antioxidant compound found in garlic. 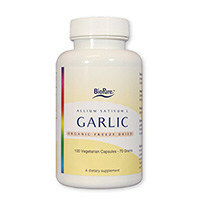 This garlic pill is also made by a reliable brand known for hypoallergenic supplements. However, it is more expensive than some alternatives, and includes more additional ingredients. BioPure Organic Freeze Dried Garlic is an effective garlic supplement that is made with freeze dried garlic. It contains about 5.4mg of allicin per serving, supporting its antioxidant, antiviral and antibiotic benefits. BioPure is a supplement brand that creates natural products from raw ingredients for various health purposes. Their manufacturing facilities are all GMP certified, and they create their supplements using a freeze drying method. Bottom Line: This freeze dried garlic pill is a good garlic option for almost anyone. It is a non-GMO vegan garlic pill that uses garlic standardized for allicin content. However, it is very pricey. 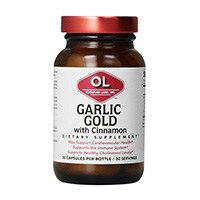 Olympian Lab Garlic Gold is a garlic extract pill that is fortified with cinnamon for its benefits. Yielding 13mg alliin and 6mg allicin. Olympian Labs is a supplement brand that is dedicated to helping people “achieve optimal health, wellbeing, and balance.” They carry supplements in 28 different health categories, all manufactured in a GMP certified facility. Bottom Line: Olympian Lab Garlic provides additional benefits of cinnamon extract. However, it does include more fillers than some alternatives, and it comes in a lower quantity. 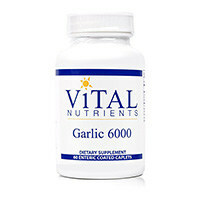 Vital Nutrients Garlic 6000 has a high alliin content that offers all of the best benefits of garlic. It is enteric coated to help ensure that the active compounds found in garlic make it to the small intestine for absorption. Vital Nutrients is a supplement producer that carries a wide variety of health products. These include products such as adrenal and energy supports, general nutrition supplements, sleep, mood and stress supports, immune supports, weight management supplements and much more. Garlic is a flowering plant that is related to the lily and onion family. It has an edible bulb which contains naturally medicinal compounds, such as allicin, aliin and sulfur compounds. Allicin is the compound that gives garlic its distinctive taste and smell, and aliin is the precursor to allicin. The sulfurous compounds in garlic have many protective health benefits, such as helping to detoxify the body and protect the immune system. This tasty spice is one of the oldest horticultural crops known. Before it was cultivated, it likely grew naturally in China, India, Egypt and Ukraine. Today it only grows wild in Central Asia. It has been used in traditional medicine for thousands of years by the ancient Greeks, Romans, Egyptians, Chinese, Japanese and Native Americans. Garlic supplements harness the best garlic benefits and provide them to you in forms such as capsules, tablets, extracts, powders and more. You can also consume raw garlic as a supplement, however the flavor is quite strong and may cause a burning sensation in the mouth and digestive side effects. General health: Garlic has been used throughout history both for culinary and medical purposes. It’s nutrient-rich, offering high levels of manganese, selenium, fiber, calcium, and vitamins. Perhaps most importantly, it contains a high concentration of Allicin, a sulfur compound that is believed to offer most of the health benefits of garlic. Allicin is likely responsible for most of the garlic benefits discussed below. Immune health: Garlic supplements – as well as garlic used in cooking – have been shown to enhance immune system function. One 12-week study noted a 63% reduction in frequency of colds reported by participants given a daily garlic supplement, compared to the placebo group. The length of symptoms was also reduced, by a whopping 70%. Another study mirrored these results, showing a 61% reduction in cold duration in participants given garlic extract. Blood pressure: In several trials, garlic supplements have been shown to reduce blood pressure in participants with high blood pressure. These trials showed very promising results, although researchers warned that relatively high doses were needed in order to achieve the blood pressure reductions desired. Cholesterol: In patients with high cholesterol, garlic has been shown to reduce LDL cholesterol by up to 10-15%. Even better, garlic is thought to have minimal to no effect on HDL (“good” cholesterol), and a consistent reducing effect on LDL (“bad” cholesterol). Antioxidant: Garlic contains potent antioxidant compounds, which can help protect the body’s cells from oxidative damage. High dose garlic supplements have been shown to significantly increase the level of antioxidant enzymes in human and animal trials, while simultaneously reducing oxidative stress. Longevity: The combination of positive health effects from garlic supplementation is thought to offer a reduction in the risk of various ailments. One study found that garlic reduces the risk of dementia and heart disease, while another noted garlic may be effective in reducing the risk of Alzheimer’s. Some even speculate that garlic may enhance longevity, although it’s nearly impossible to prove the root cause of a boost in longevity. Detoxification: At high doses, the allicin found in garlic may help to reduce heavy metal toxicity in the body. In one clinical trial, workers at a car battery plant that were regularly exposed to lead were given high dose garlic supplements. After 4 weeks, lead levels in the blood were reduced by 19%, and participants noted a reduction in blood pressure and headaches, as well. Overall, garlic can have a huge variety of positive effects on many aspects of health. Notably, both garlic supplements and garlic used in cooking have similar benefits – although some studies specifically used an aged garlic supplement. Those with Flus and Colds – Garlic is a powerful antioxidant and immune-booster. The antioxidant benefits of garlic supplements help to protect the immune system from free radical damages due to stress, toxins, pollution and the aging process. It also helps boost immunity due to antiviral and antibiotic garlic benefits – helping to fight viruses like colds and flus! Those with Cardiovascular Health Problems – The majority of research into garlic’s benefits for cholesterol have found that garlic can help to lower cholesterol and total triglycerides in the bloodstream, reducing risk of conditions. Garlic also works as a natural ACE-inhibitor due to its gamma-glutamylcysteine content, which basically means that it lowers your blood pressure! It also has fewer side effects than prescribed ACE-inhibitors, making it effective for supporting your overall cardiovascular health. Menopausal Women – Menopause is a natural process that generally affects women in their 40s and 50s. It is a decline in reproductive hormones resulting in side effects such as hot flashes, mood swings and fatigue. Garlic can help to ease the symptoms of menopause – especially hot flashes and night sweats. Garlic also helps to support the liver, helping to detox the body of waste hormones. Athletes – Garlic is beneficial to athletes because they can help to enhance oxygen supply to the muscles. This can improve athletic endurance and enhance effectiveness of aerobic workouts. They also improve overall blood circulation, enhancing muscle pumps during resistance training. Garlic supplements also help the body detox, reducing the risk of muscle pain and soreness post-workout. If you are looking to better yourself as an athlete with natural supplements, garlic is one of the best options for you. Learning and Memory – Garlic supplements can help to enhance blood circulation, which can help improve brain function! Some studies have found that aged garlic extracts can help protect against brain function loss due to its ability to enhance memory, longevity and cognitive functions. This means garlic has the potential to help support the cognitive functions of those with conditions affecting learning abilities and concentration. It can also help to keep your brain sharp as you age! Those Trying to Lose Weight – One of garlic’s potential benefits is great for those looking to shed a few pounds. Some preliminary studies have discovered that garlic helps to boost the metabolism, which results in an increased number of calories burned every day. Aged garlic extract specifically has been studied for its weight loss benefits, and one study found that aged garlic extract can help to reduce weight by a half pound per week. It also helps improve the efficacy of exercise, so paired with a healthy diet and exercise it can be even more effective for weight loss. It can also support a healthy weight and promote weight management. Garlic is generally a well-tolerated supplement, and does not often cause harmful side effects. It may cause mild side effects such as bad breath or body odor. Raw garlic is more likely to cause these side effects, and also a burning sensation in the mouth. Less common side effects may include an increased risk of bleeding and asthma from allergic reactions. Garlic can be taken in split doses or single daily doses. It is also taken in combination with other natural supplements in order to enhance effectiveness. Many garlic supplements are best taken on an empty stomach. When taken on an empty stomach, the effective compounds in garlic supplements won’t be destroyed by stomach acid. However, some are better taken with food, and will say so on the supplement. Garlic may interact with medications such as blood thinners and ACE inhibitors, so talk to your doctor before taking garlic supplements if you are on medication. Garlic supplements are highly stackable with other herbal remedies to improve overall effects. The most beneficial garlic stacks may be tailored to your particular health needs, and can help to naturally enhance your health. Garlic and Green Tea Extract – Garlic supplements can be stacked with green tea extract supplements to boost antioxidants, heart health, brain and liver health. These two complementary natural supplements work together to enforce each other’s health benefits, making this a good garlic stack for antioxidant benefits. Garlic and Fish Oil – Garlic can be stacked along with fish oil supplements for synergistic benefits. Taking them together improves both of their benefits, making this a good garlic stack for those interested in improving their cardiovascular health. A high quality garlic supplement is made using as few additives as possible, and the highest quality sources of garlic. The best forms for garlic supplements include garlic pills, tablets and extracts. Lastly, the value of the particular product in question should always be a factor – you don’t necessarily want the cheapest option, but there’s no need to pay a small fortune when there are more affordable options available. If you compare prices, try to do the calculations based on the price per serving of garlic, not just on the price of the package.